First we were told that the high number of freight trucks moving through the Lehigh Valley will double in 25 years. Then we were told that like those big beach waves that smash you with no warning, the waves of e-commerce warehouses with their endless trucks and low-paying jobs will keep coming. Now the latest version of this ugly scenario is that the Valley is on the precipice of becoming part of what could eventually become the nation’s largest “Inland Empire” of warehouses stretching all the way to Harrisburg. We can only hope that our township governments use their exclusive power of zoning to stop this warehouse onslaught that threatens our beautiful Valley. Ironically it has been the townships’ misguided use of their zoning power that has allowed these low-value giant hulks to proliferate across our landscape. Only the townships can reverse this trend by changing their zoning to severely restrict where new warehouses can be built. Some of these townships have operated for years under the false belief that their zoning districts cannot be changed and that they must keep accepting more warehouses. The critical problem is that every township wrongly includes warehouses in all their commercial and industrial zoning districts. And warehouses will continue to fill up these zoning districts because they are essentially the only economic game in town. 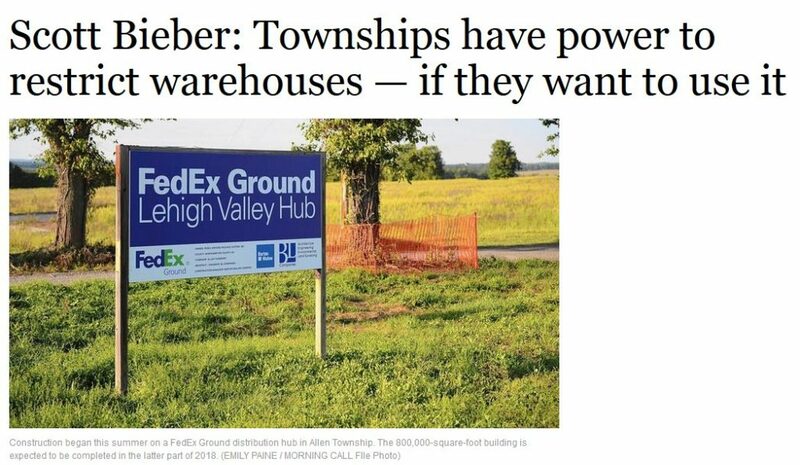 That’s because the Lehigh Valley is a very lucrative place to build these e-commerce warehouses where goods are brought in by truck and then sent out by truck. Our flat farmland is ideal for building these giant concrete boxes. We are situated in the middle of a major road network that serves the most populous region of the country. And we are within two hours of the New York and New Jersey ports that will soon see even more goods coming from Asia on bigger boats that can now get through the newly expanded Panama Canal. Of course there are suitable places for warehouses, especially on abandoned industrial sites or near the interstate highways so the truckers don’t have to weave through rural roads and suburbs to get to the highways. Some argue that these warehouses are good because they produce hefty tax revenues that help fund our schools and police and thereby keep our property taxes lower. And even if the warehouses offer mostly low-paying unskilled work, at least that’s better than no jobs. It certainly makes our employment statistics look good. But do we really want to keep sacrificing our most valuable asset, our land, to become the storage pantry for the East Coast? Would it not be better to hold onto our remaining open land for more lucrative manufacturing plants, which our business leaders like to point out are still coming into the Valley? Do we really want to bequeath to future generations a community of sprawling concrete boxes and truck-clogged roads? We need township leaders with the guts to change their zoning to limit warehouse growth. We need township leaders whose main concern is the quality of life of their communities, not the next tax buck they can get from a new warehouse. Lawyers will argue rightly that a township must allow all uses, including warehouses. But townships can severely restrict where they can be built, just like a quarry or some other less than desirable use of the land. And when warehouse zones are filled up, townships are under no legal obligation to keep providing more zoning space for warehouses. We are under no obligation to let ourselves be overrun with warehouses. The Lehigh Valley Planning Commission, which is supposed to guide the townships in the good development of our Valley, has offered no significant advice on how to restrict warehouse development. Townships apparently will have to control them on their own. But don’t count on your township officials to take a stand on their own against warehouses. They often need pushing from the public they serve. And if that pushing is not soon forthcoming, the Inland Empire of Warehouses will be. Scott Bieber is a resident of Upper Milford Township.